As Profootballtalk.com pointed out, the Panthers had a vacancy for a traditional running back after letting Jonathan Stewart go. They were not able to land one in the draft, so instead they found a former 1,000-yard rusher. 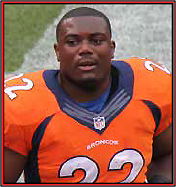 ... Anderson was released by the Broncos, despite rushing for 1,007 yards last season. Undrafted in 2013, Anderson first emerged as a factor over the final eight games of the 2014 season, when he combined for 1,057 yards and 10 touchdowns to earn a Pro Bowl appearance. In 2015 (including the postseason), he had 1,176 combined yards and seven rushing touchdowns. He was on pace for nearly a 1,300-yard rushing/receiving season in 2016 when he was halted by a Game 7 knee injury. He averaged 4.1 yards per carry last season and added another 224 yards on 28 catches. As 9News.com's Mike Klis noted prior to his release, "Anderson just turned 27 so he figures to have plenty of good football left in his powerful, tackle-breaking legs. ..." A number of teams were interested, but the Panthers might have had the greatest need and Anderson will provide a solid complement to Christian McCaffrey, who has varied skills but may not ever be an every-down NFL back. As the Sports Xchange reminded readers, Anderson looked to be getting on track before he suffered a torn meniscus in Week 7 against Houston. He has been doing his injury rehab at the team's suburban Denver complex throughout the offseason and was fully cleared for the start of OTAs. Anderson has consistently said he would return from last October's knee surgery "better than ever" and he should be a part of the solution this year after Devontae Booker showed flashes as a rookie but was inconsistent and ultimately worked behind December waiver claim Justin Forsett. At the very least, Anderson projects as the starter ahead of Booker and newcomer Jamaal Charles. But new HC Vance Joseph has declared the competition open. ... Booker's shortcomings should ease Anderson's path back to the featured role (assuming the knee isn't a problem) and, as CBSSports.com notes, with the addition of OL Ronald Leary and Menelik Watson, as well as the return of OC Mike McCoy, a fully healthy Anderson could enjoy more room to run this season as long as he's the same guy we saw before last year's injury. That's something to watch as the regular season draws near.